The problem with this film is that by now I'm kind of exhausted, straight up tired of watching Jack Black playing a character who spins so much lies, it becomes a tangled web he's woven situation, tired of watching Jack Black's character claiming to be somebody he's not. It was great in "School Of Rock" but then another round in "Gulliver's Travels" and now this. That said, nobody could do this type of lying better than Jack Black. 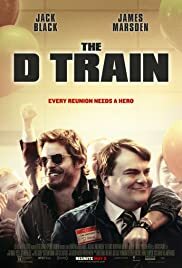 THE D TRAIN, from writing/directing team Jarrad Paul and Andrew Mogel, stars Jack Black as a high school reunion committee self appointed leader named Dan Landsman who the audience could figure out instantly, didn't have a great high school experience. He has trouble trying to get his old classmates to come to the reunion and even his own committee thinks he's a loser. When all of a sudden, he watches a commercial featuring one of his graduating classmates, Oliver Lawless, played by the heartthrob James Marsden. Dan (Jack Black) concocts a plan to go to Los Angeles to convince Oliver (Marsden) to attend their reunion so that he could score cool points with the others. But not ever goes smoothly as planned, Dan comes up with a fake deal to try and get his boss to fund his travel but his boss (Jeffrey Tambor) is so eager and excited about the prospect, he decides to tag along. 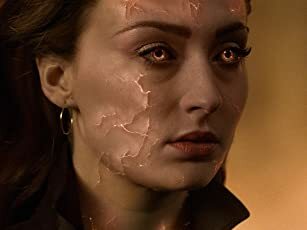 Some of us liked our high school experience, but for the majority, people would probably say that they're glad to be out of there, life starts in college after all. 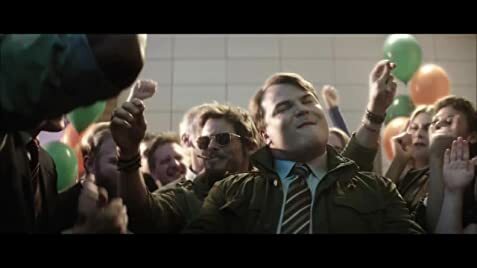 Jack Black's character represents anybody who wishes they could press the reboot button on their adolescence. His character is not only insecure but feels like nothing else, not even his own son is as important as his pursuit of coolness among his peers. Whereas James Marsden's character profoundly represents people's misconception about show business. People often associate it with glamor, fame and fortune, and to a certain extent, that may be true, but many of the people traveling to L.A. and try their luck, only end up doing small gigs and waiting tables while waiting for their big break at the same time; a big break that may never happen. So these are two very sad individuals who lie to themselves and lie to the people around them. I have to give kudos to Jack Black and James Marsden because there is one particular sequence that you wouldn't see coming, some of you would probably, but it goes to show how professional Black and Marsden are, what they're willing to do and how far they're willing to go for the sake of the story. And that particular scene sets off a chain of events that lead to the climax and self realization. But again, seeing Jack Black in this type of role, is nothing new, but I guess this is his niche, his field of expertise. Overall, I think THE D TRAIN is a dark comedy that doesn't necessarily slap you in the face and tell you to snap out of it, that it was just high school for heaven's sakes, but it does have its own silly way of unburdening yourself from all the lies.